Perfect for Creating Holiday Greeting Cards, Invitations & Announcements, Ideal for Birthdays, Holidays and More. 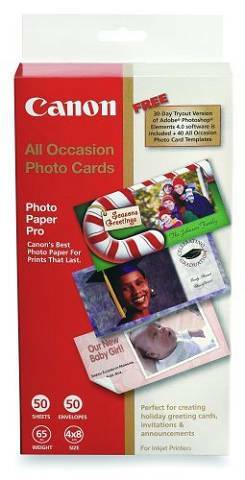 The Canon All Occasion Photo Cards contains 50 Sheets of 4" x 8" Photo Paper Pro plus 50 Matching Envelopes. This package also includes Free 40 All Occasion Photo Cards Templates (requires Adobe Photoshop Elements 4.0).